It’s hardly a secret that we are headed toward a change in administration next year. I’ve been through these transitions several times, as have most acquisition professionals. 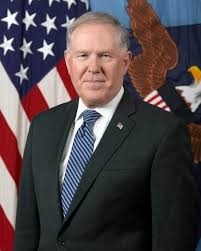 During my previous experience in the Pentagon organization of the Under Secretary of Defense for Acquisition, Technology, and Logistics, I worked for a total of eight Under Secretaries in as many years, and I went through one same-party and one other-party administration change. As some of these transitions approached, there were attempts to cram a lot of accomplishment into a very short time. This generally caused a lot of work and wasn’t very successful. In my case, I have had several years to effect the improvements in defense acquisition I thought were most needed. As a result, there won’t be a Better Buying Power (BBP) 4.0 this year and, while I do plan to modify Department of Defense Instruction (DoDI) 5000.02 on the margins and to make it consistent with current law, there also won’t be a major acquisition policy rewrite this year, although we will be implementing the changes required in the Fiscal Year (FY) 2016 National Defense Authorization Act. We still have a lot to do in implementing the existing BBP actions, however. Also, the new DoDI on the acquisition of services has just gone into effect, so we still have work to do on implementation of that as well. 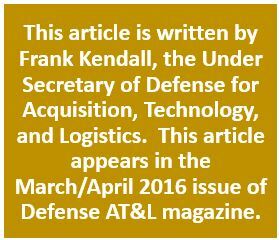 Frank Kendall, Under Secretary of Defense for Acquisition, Technology and Logistics. What I would most like to accomplish during the balance of this year is to sustain and build on the momentum we have achieved over the last few years. I don’t know what will happen in the election, and, depending on how it turns out, I also don’t know what opportunities I may have. But I do know that we have the better part of a year together in which to make more progress on the areas in which we have been working. I also know that we are improving acquisition outcomes. The evidence is clear from the most recent Annual Report on the Performance of the Defense Acquisition System and other data that contract costs and schedule overruns are being reduced, as well as cycle time, and that we are tying profit more effectively to performance through the use of incentive structures. I would like to discuss some of the actions that stand out as important areas in which to sustain and build on the momentum we have gained as we get ready for a new administration next year. We are well into implementing BBP 3.0, but we have many actions in progress that need to be completed. My concerns about technological superiority that motivated this edition of BBP are reinforced every time I receive a daily technical intelligence update. This year’s budget includes a number of advanced technology demonstrators and experimental prototypes and we need to get these provisions enacted and the projects started. Steve Welby, who has been confirmed as Assistant Secretary of Defense for Research and Engineering, and his teams completed the Long Range Research and Development Planning Program, which was very influential in the FY 2017 budget. We are strengthening the ties between operators, intelligence experts, and acquisition professionals. We will continue to manage the ongoing actions to improve our workforce’s technical capacity, and to extract as much benefit as possible from all of our various Research and Development accounts and from industry’s investments. Bill LaPlante has left his position as Assistant Secretary of the Air Force, but his dictum to “own the technical baseline” is an enduring imperative to all of our technical and management professionals working to bring new products to our warfighters. As I have said many times, our technological superiority is being challenged in ways we have not seen since the Cold War, and we must respond. We have been doing this for more than 5 years now, and there is solid evidence that both the analysis process by Service programmers and the enforcement of caps by the acquisition chain and the requirements chain are having a beneficial impact. The use of long-term capital planning analysis was a new concept when we introduced it, but it is becoming institutionalized. We can’t predict future budgets accurately, but we can do analysis now that helps us make better decisions. Enforcing the resulting caps is the most difficult aspect of having them, but if the caps are to be meaningful, they have to be enforced. We’ve learned from our experience, but this is still an evolving area. The caps should be set at a level that leaves some margin; they are neither cost positions nor program baselines, nor budgets. They are tools to ensure meaningful long-term capital investment planning and to guide cost versus performance trade-offs during development. I am hopeful that the Department of Defense (DoD) will continue to establish them and enforce them in subsequent administrations. I believe that in many, but not all, cases “should cost” is now a normal part of business. It should be. Every manager should understand the cost structure under his or her control, analyze it for savings opportunities, set goals to achieve those opportunities and act on those goals. After several years of effort, the use of “should cost” has proliferated across the DoD. It is changing thought patterns and behaviors in a positive way. That implementation isn’t uniform, however, and I’m afraid it hasn’t been fully embraced in all cases. Some still regard this initiative as a threat to their budgets, which it is definitely not. Others seem reluctant to set significant goals for fear of being unable to attain them. The “culture of spending” isn’t dead yet, and the perverse incentive of execution rate targets isn’t going away. We need to continue to strike the right balance and to encourage our workforce to do the right thing for both the taxpayer and the warfighter by not wasting resources that could be saved and put to a better purpose. Of all the BBP initiatives over the years, this is the most fundamental thing we have done. Use of “should cost” targets has saved the DoD billions of dollars, and we need to continue expanding and supporting its use. As I have said and written many times, industry is easy to motivate. Corporations exist for the purpose of making money for their shareholders, so the motivation tool is obvious and effective. The trick for the DoD is to align this self-interest with the DoD’s interests, and to do it in a way that will be effective at improving outcomes. We’re making progress on this, but I still see some unevenness in how our managers structure incentives. It takes good critical thinking to get incentives “right” because we deal with so many different business situations. Incentives need to “thread the needle” between being easily achieved and impossible so that they do influence behavior. They also need to be meaningful financially both as carrots and sticks, without asking corporations to assume an unreasonable amount of risk. I’ll continue to focus on this aspect of our acquisition strategies as programs come in for review, and I’ll expect managers at all levels to do the same. Going back to BBP 1.0, we have worked hard to mature our collective understanding of how to protect the government’s interests while also respecting industry’s property rights. This is a complex area of law and one in which the DoD was at a longtime disadvantage relative to industry. I occasionally still wrestle with cases of “vendor lock” based on proprietary content. Hopefully, we have all but stopped the practice of just accepting industry assertions of property rights. We need to continue to grow our expertise in this area and spread the best practices associated with effective management of intellectual property. It’s perfectly legitimate for a company to expect a reasonable return on the intellectual property it has developed or acquired. In general, that return should be in the competitive advantage conveyed by superior technology or lower costs. On the other hand, the use of intellectual property by a firm to sustain a decades-long grip on the aftermarket for a product is something the DoD should and can work to prevent. We’re getting better at this, but our efforts need to be sustained and broadened. This idea is anything but new. However, our practice has traditionally not matched our policy. It takes active technical management of design architectures and interfaces to make both open systems and modularity a reality. This is “owning the technical baseline,” and the devil really is in the details. Assertions of modularity and openness are not always valid. There are also always cost impacts and design trades that work against achieving these goals. We can point to a few successes in this area over the last several years; each Military Service can take credit for programs to provide open architectures in general and modular designs on some specific platforms. The Long Range Strike Bomber is a notable example. This effort should continue and expand, but success will require a technical management workforce that is trained, experienced and empowered. We’ve had several notable successes with this initiative. They include the Combat Rescue Helicopter, the Joint Light Tactical Vehicle, and the Amphibious Combat Vehicle. This is a relatively new concept; it asks the requirements community to do something that it has traditionally resisted—put priorities and relative value on requirements. Industry traditionally would simply bid threshold values of performance. This initiative gives industry a reason to aim higher, as long as it can do so for a reasonable cost. By providing industry with information on how much we are willing to pay, and how much competitive source selection evaluation cost credit we will give in an evaluated price, we motivate industry to create better products for us. We also get the benefit of more objective source selections. This is a useful property in a period in which protests are more common. The fact is we have to make these best value judgments anyway. We are better off to make them rationally prior to asking for bids. I hope to see several more successful examples of this approach over the balance of the year and to see it continued indefinitely. With the publication of DoDI 5000.74, we marked the transition to a more structured way of looking at management of contracted services acquisitions. This is one culmination of a series of steps that date back to BBP 1.0, where we took Air Force initiatives introduced by now LTG Wendy Masiello when she was the Air Force’s Program Executive Officer (PEO) for Services Acquisition and expanded them to the rest of DoD. Over the last several years, we have built on these initial steps. Despite this progress, I remain convinced that this area of spending, which is now well above the spending on products, offers the greatest potential for savings and efficiency in the DoD. My Principal Deputy, Alan Estevez, has led this effort and it is starting to pay big dividends. As we go through this year and gain experience implementing the new DoDI, I would expect us to gain insights that will lead to some modifications, but overall I think we are the right track. This is one area in which I will ask the Service Secretaries and Chiefs to become more involved. A great deal of contracted services are acquired and managed outside the standard acquisition chain and institutions. As Gen. David Petraeus once wrote to his staff in Afghanistan, “Contracting is commanders’ business.” This is as true outside the operational contingency arena as it has been in Afghanistan and Iraq. However, many of our operational and institutional leaders are not focused on the management of these extensive resources. During the coming year, we can and will do more to change that. We have instituted three sources of annual assessments that will be continued this year. They are: the Annual Report on the Performance of the Defense Acquisition System, the Annual Preferred Supplier Program, and the Program Mangers’ Annual Assessments. The first of these provides a growing body of statistical data and analysis on the performance of the acquisition system using a range of metrics. The third edition, released last fall, shows strong evidence of improved performance over the last several years. Each year we have added additional data and analysis to this volume and we will continue to do so this year. The second item provides public feedback to industry on the relative performance of major business units based on the Contractor Performance Assessment Reporting System (CPARS). We struggled to get this off the ground, but thanks to the Navy’s pilot effort led by Sean Stackley and Elliot Branch we were finally successful. Last year, all three Military Departments published their results simultaneously. We will continue that practice this year. The third item is the Program Manager’s Annual Assessments, of which I published a subset last fall. I published them (with the writers’ permissions) because I was very impressed with the inputs I received and because I thought providing them to a wider audience was a great way to educate outside stakeholders on the great variety of real life problems that our program managers face, and how professionally they deal with those problems. I recently requested this year’s assessments and they will be submitted by the time this piece is published. At the PEOs’ request, I am also giving PEOs an opportunity to provide a similar input. I will do my best to dedicate two solid weeks to reading and responding to each of the 180 odd assessments I will receive. Last year’s reports highlighted a number of problems and opportunities that needed to be addressed; and I expect the same this year. I also will request another round at the end of 2016. The DoD has an incredibly professional workforce. When building professionalism was introduced in BBP 2.0, there were some who took that as an assertion that our workforce is not professional. Nothing is further from the truth. However, we all can become even more professional through experience, training, education and personal effort. None of us should ever be complacent; there is always more to learn and always opportunity for increased levels of expertise and broader experience. We also all have a duty to improve the professionalism of those who work with and for us. If there is one legacy each of us should strive for, it is to leave a more professional workforce behind us than we found when we arrived. We are fortunate to have the support of the Congress and Secretary of Defense Ashton Carter in this endeavor. Our Director of the Human Capital Initiative for acquisition personnel, Rene Thomas-Rizzo, has worked hard with the Under Secretary for Personnel and Readiness Brad R. Carson to include provisions in Secretary’s Force of the Future initiatives that will benefit our workforce. We will work hard with the Congress and internally to see those initiatives enacted this year. The most recent National Defense Authorization Act included provisions strengthening the Service Chiefs role in acquisition. I fully support this direction and have already met with all four Service Chiefs to discuss their role. The areas in which I think they can make the greatest contribution are in requirements, budgeting and personnel. As stated above, I also think they can do much to improve the management of acquisition activities that take place outside the acquisition chain of command. During the year we will be implementing this direction. The BBP initiatives have spanned several major areas of emphasis, included dozens of specific initiatives, and involved more than 100 actions—in each version. There also have been any number of steps we have taken over the past several years to improve acquisition outcomes across the full range of products and services that DoD acquires. Many of them have been outside the specifics of the BBP initiatives. Underlying all this effort are some fundamental cultural goals. One of them is to move from being a culture that focuses on spending to one that focuses on controlling costs. This may be the area in which we have made the greatest gains. Another has been to encourage a culture that values and encourages the critical thinking needed to confront the huge range of problems acquisition professionals must deal with. We are not engaged in cookbook activities where one way of doing business always works. A third goal is to achieve the widespread appreciation of, and a culture that values, professionalism inside our workforce and, perhaps more important, outside it. Our success depends entirely on the efforts of thousands of true professionals in the full range of disciplines needed for new product design, testing, production, and support. Finally, there is the resurgent importance of being a culture that values and rewards the technical excellence and innovation needed to stay ahead of the committed and capable adversaries we may face in combat. Building and sustaining these aspects of our culture is a task that should never end.